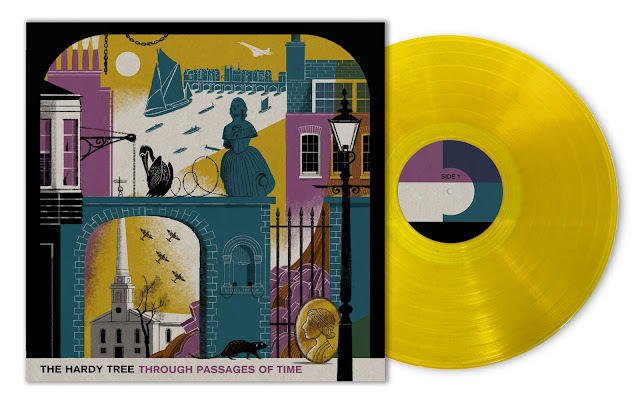 Clay Pipe Music: The Hardy Tree - 'Through Passages of Time' Repress. The Hardy Tree - 'Through Passages of Time' Repress. 12" vinyl, in reverse board sleeve. 500 hand numbered copies. SPENCER'S PICK OF THE WEEK - The Hardy Tree, Through The Passages Of Time (Clay Pipe Music) Another beautiful release from Clay Pipe here. Delicate melodies weave themselves in and out of wonderful, warm Moog synths & mellotrons creating an enchanting wistful paean to an England long forgotten. This is hauntingly beautiful and easily one of the records of the year. Please go seek it out and support this amazing label. Spencer Hickman, (DeathWaltz Records) Mondo Music Weekly. Through Passages of Time provides elegies for locations such as Newport Market, Sandbridge Court, Sluice House Tavern, even (*shudder*) Cut Throat Lane. The happy use of Moog, Mellotron and other seemingly antiquated instruments is both tribute and reflection. A Closer Listen.